Getting Search Volume for Keywords can be done within the Keyword Management page or Keyword Group page. Whenever you add new keywords to tracking, we will automatically retrieve search volumes for these newly added keywords for each of their tracked search engines. 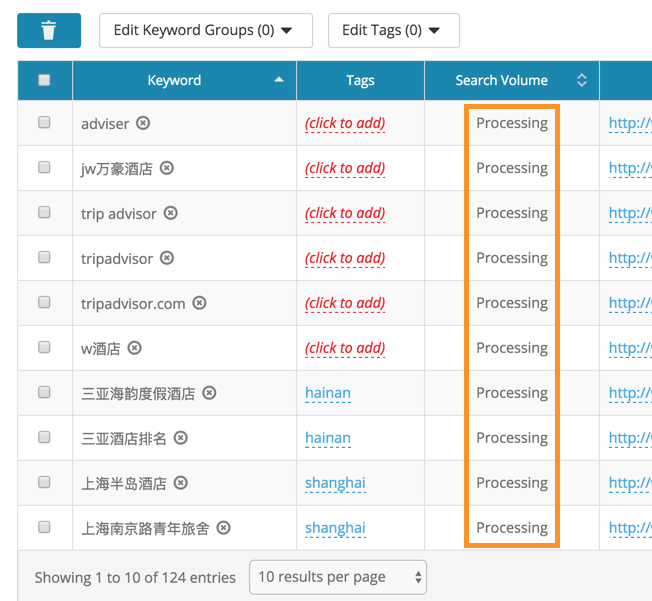 Search volumes for your tracking keywords will be updated regularly as well. You can view search volume data in Keyword Management and various reports like Keyword Ranking, Landing Page Ranking, Competitor Keyword Ranking etc. Note: Please keep in mind for each keywords, only search volume for its tracked search engines will be provided - so if you have multiple keyword groups with different tracked search engines in your campaign, you might see some keywords have missing search volumes in search engines where they aren't tracked in. Search volume for your newly tracked keywords might take a little while to be retrieved depends on the search engines / number of keywords added. You will get a "Processing" wording in the keyword table. While we are collecting these data for you you don't have to stay in the same screen, we will show these data for you automatically when they are ready.